A few weeks ago I was asked by a lovely lady if I’d be the “entertainment” for her daughter’s 8th birthday party. Here’s Lucia’s take on her daughter’s special day. 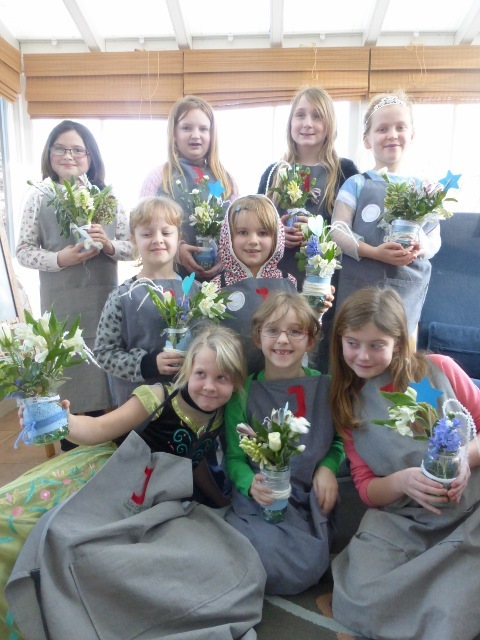 Isabella wanted a party at home for her loosely Frozen-themed 8th birthday and for it to have an activity. She always wants a party at home. But, as she has a winter birthday, we can’t rely on being outside and space is limited indoors. Previously we’ve made Lego figures and crafts at her parties, this year I wanted something more challenging that would keep the kids occupied for longer. I also liked the idea of the girls taking home something special and unique that they had made, rather than a party bag. I had been to a Christmas door wreath workshop that Julie ran and saw how much the children there enjoyed the experience. 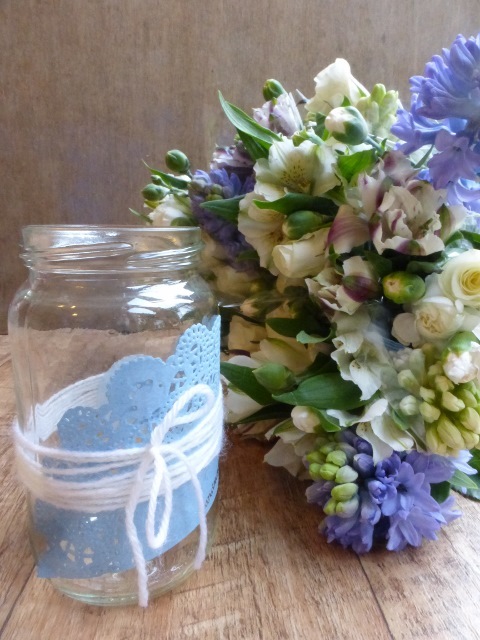 I did a little research online for ideas and came up with Frozen-themed flower arrangements in jam jars. As I knew I was going to be really busy before Isabella’s birthday I contacted Julie and asked whether she’d run a workshop for Isabella and her eight friends. 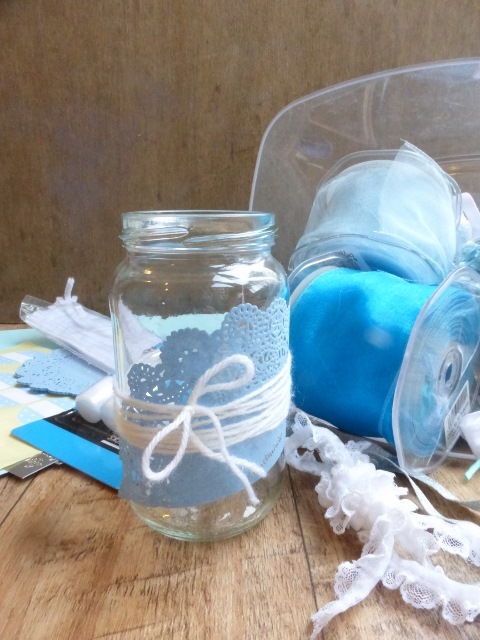 Julie steered me towards ideas that would work for a children’s party and had lots more practical suggestions of suitable flowers and ways to decorate the jam jars. Once all was agreed I just had to confirm numbers a week before and wash out the jam jars I’d been saving. On the day of the party Julie arrived in plenty of time to set up before Isabella’s guests arrived, having prepared all the flowers and other bits and pieces beforehand. Everything she brought fitted into two neat crates so the activity only took up one room. The children were really excited and happy to pick their places and select jam jars. Julie was brilliant at running the activity. She learned the girl’s names quickly and used lots of strategies to keep them engaged. She took them through each stage by demonstrating it, and then giving them more ideas to try. 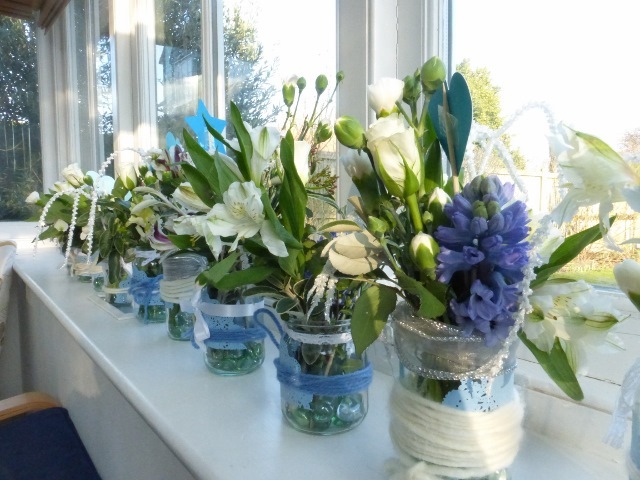 Whether it was designing name tags, tying wool or adding the greenery and flowers, each arrangement soon looked different and the children loved showing off and comparing their creations. The room was so calm: a mixture of quiet concentration and chatting amongst themselves, about their design decisions – and there were lots of giggles too! The children were thrilled with their final arrangements and so delighted to show them off to their parents. I sent them outside to play and let off some energy before the birthday tea whilst Julie tidied up, which took only a few minutes as she was so organised. I’d love it if you shared this blog post with your friends, family and work colleagues – it may just be what they’re looking.